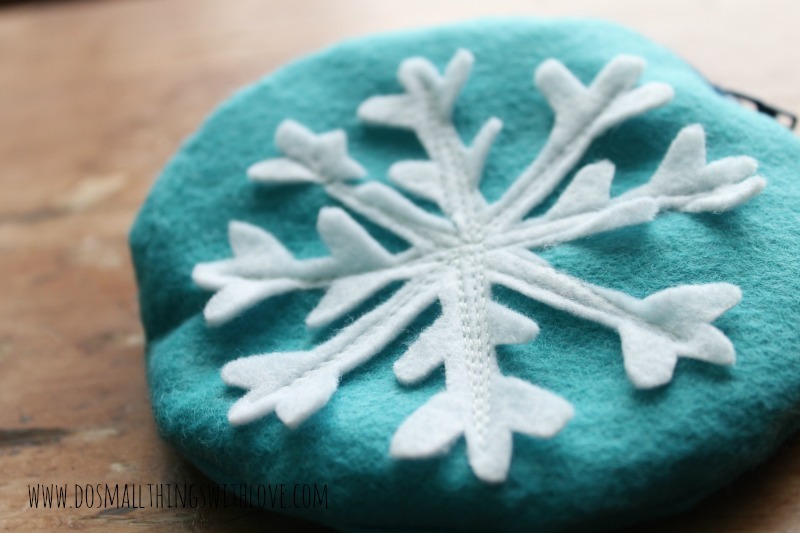 Using the Teal Felt, cut out 2 5″ circles. Use THIS METHOD to get a precise cut. 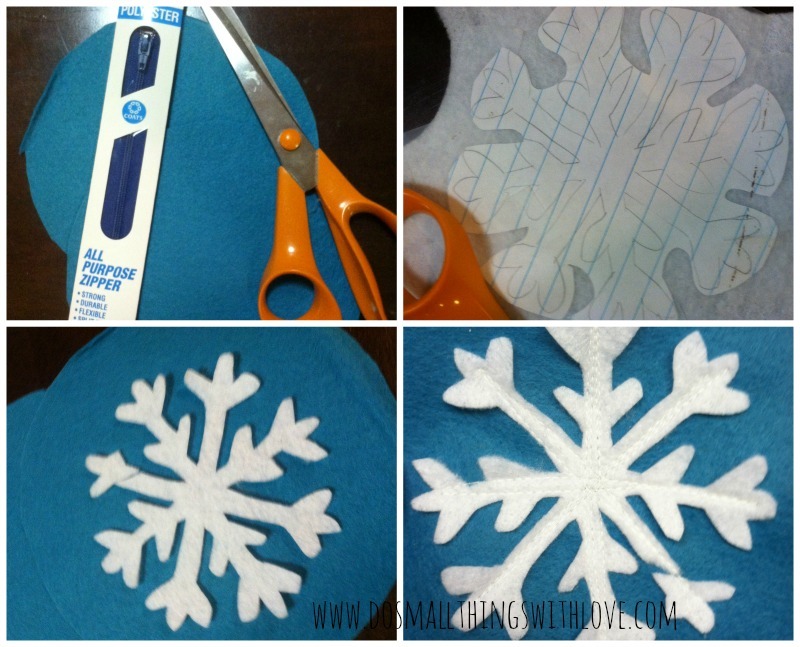 Trace/draw your snowflake shape onto paper. I traced a snowflake I found in the overlay section on PicMonkey. Then, using the packing tape, tape the paper directly to the white felt, and carefully cut out the snowflake shape. Make sure your scissors are sharp! As you can see, I accidentally snipped off the end of one of my stems. oh well! 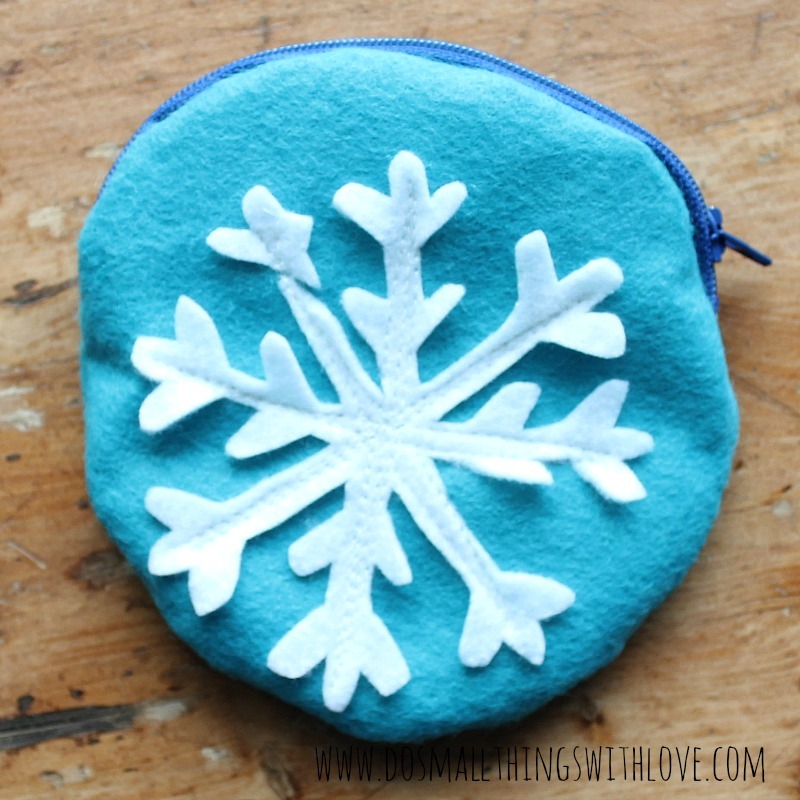 Center the cut-out snowflake on one of your teal circles. 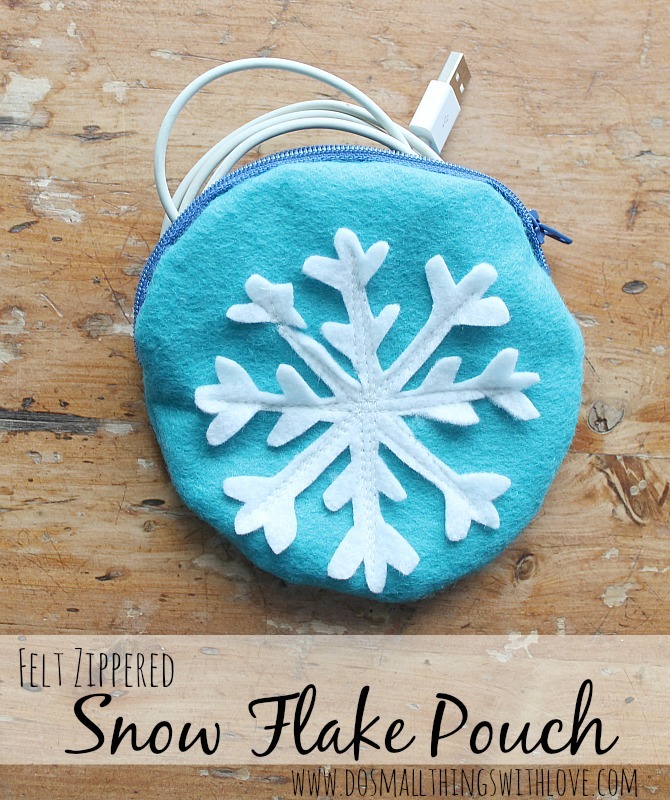 Head to the sewing machine and using white thread and a straight stitch, stitch down all of the straight stems of the snow flake. I stitched up and down a couple of times. Time to put in the zipper. Now, since we are using a straight zipper along the edge of circle, this is going to be a little tricky…and it won’t be perfect! With right sides in, sew one edge of the zipper along the top edge of the back circle. Then, unzip the zipper. Once again with right sides in, sew the other side of the zipper onto the front circle. Once that is complete, zip the zipper about 1/2 way shut. Match up the two circles, with right sides in and sew along the outside. 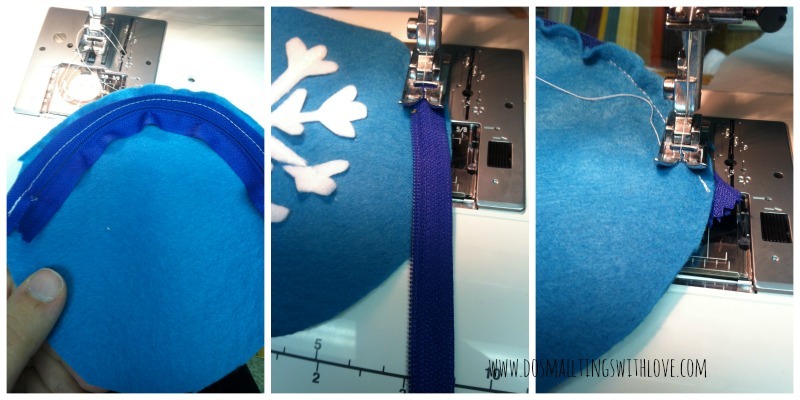 Make sure to sew over the edges of the zipper at both ends, so your pouch doesn’t have any holes! Finally, unzip the zipper and flip the pouch right side out, pushing out the edges. I don’t know about you, but I can always use another pouch. We are on the road a lot and I have a tendency to just shove odds and ends, like chargers, in odd places…and then have a terrible time finding them. It’s also important that things zipper shut. And, here are our Projects! 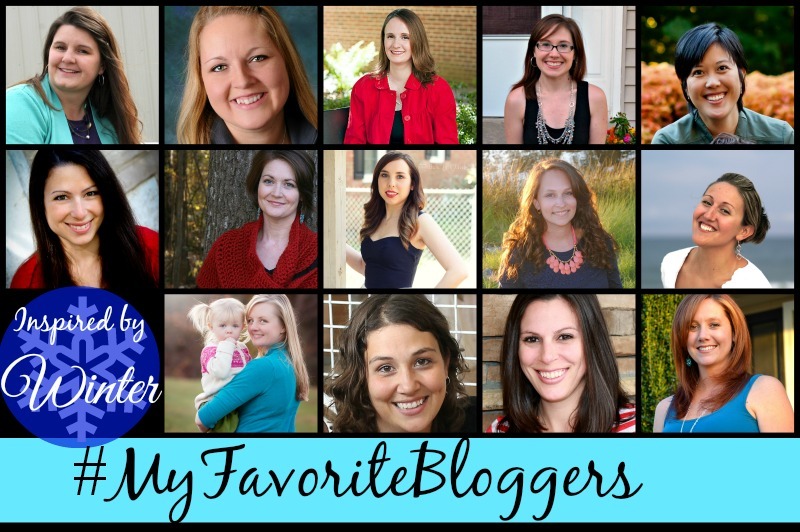 Please take a minute to visit some of my friends and their wonderful blogs! I promise that you won’t be disappointed! What a fun pouch! I love felt since you don’t have to finish off seams! BEAUTIFULLY done! This is so cute! I love the snowflake! What a cute little pouch! This is so cute, Nancy! 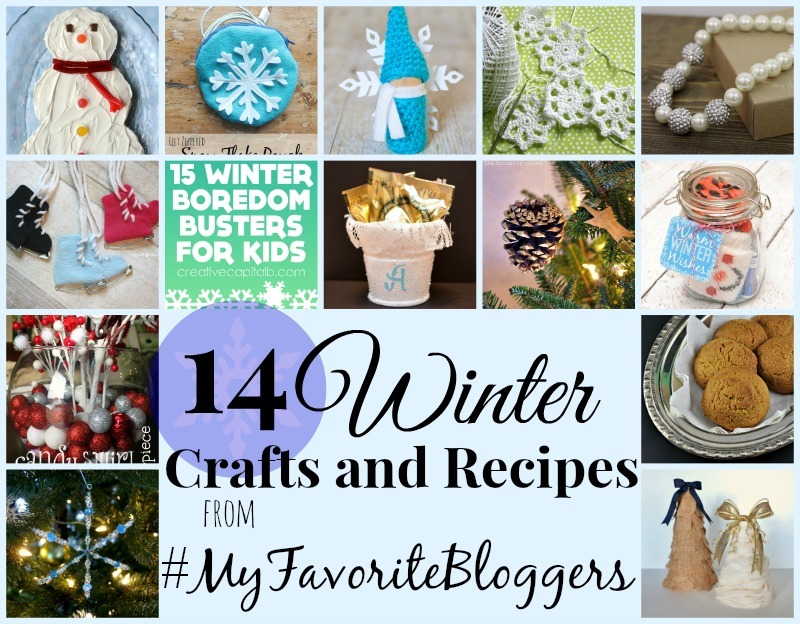 I can’ t believe how quickly you can whip up something so lovely! I’m definitely going to try zippers this year. I’m like ChiWei – they make me nervous! I am so TERRIFIED of zippers and you make it look so easy! 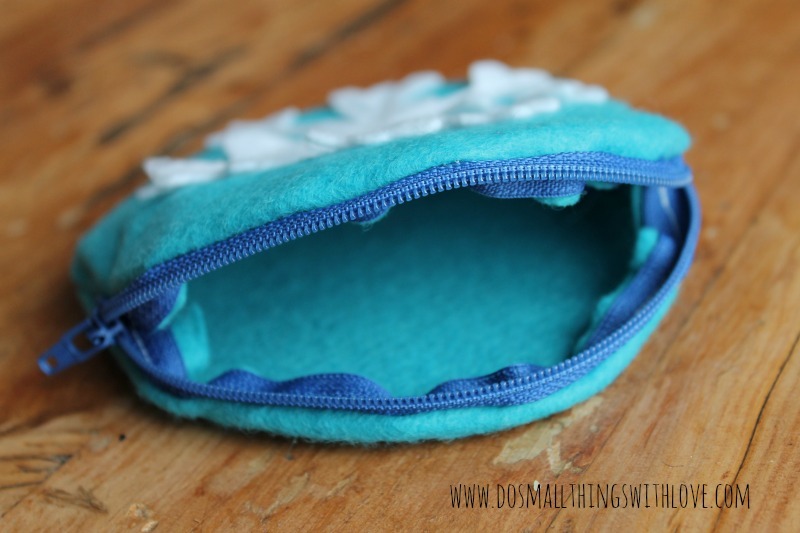 I love the idea of using felt so I don’t have to worry about linings and raw edges. And yes, we can all use more pouches!